William Appleton Potter (December 10, 1842 – February 19, 1909) was an American architect who designed numerous buildings for Princeton University, as well as municipal offices and churches. He served as a Supervising Architect of the Treasury from 1874 to 1877. He became an assistant professor at Columbia College, where he taught chemistry for a year, after which he spent another year touring France. His collegiate background distinguished him from most architects of the first half of the 19th century, who received their training through apprenticeship in the building trades and sometimes in the offices of practicing architects. The apprenticeship tradition was still strong, however, and Potter received his professional training first in the New York office of George B. Post, and then in his half-brother's office at Schenectady. Potter died February 19, 1909. Among his apprentices was the architect James Brown Lord. Chancellor Green Library, Princeton University (1871-73). 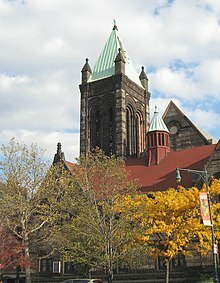 St Martin's Church, Harlem, New York City (1888). Chancellor Green Library (1871–1873) for Princeton University was Potter's first major commission. In it, he took the High Victorian Gothic vocabulary and octagonal form used by his half-brother for the Nott Memorial at Union College, and elaborated it into a complex interplay of octagons of various sizes and shapes. For Princeton, retaining Potter represented a shift from dependence on Philadelphia architects to a New York practitioner. He would receive from the college an honorary Master of Arts degree in 1872, and go on to design several other buildings on campus. From 1874 to 1877, Potter served as supervising architect of the United States Treasury. Under his supervision, designs were produced for customhouses, courthouses, and post offices in Kentucky, Indiana, Massachusetts, Georgia, and Tennessee. Concurrent with his years at the U.S. Treasury, Potter formed a partnership with Robert Henderson Robertson. From 1875 to 1881, along with major public projects, the firm produced summer vacation cottages in Newport, Rhode Island, and the Jersey Shore. This included the Adam-Derby House at Oyster Bay, New York. Potter was the uncle of Mrs. J. Kennedy Tod (Maria Howard Potter) daughter of Howard Potter, and in 1887 Potter designed Innis Arden House and several other buildings for Mr. and Mrs. Tod's Greenwich, Connecticut estate, known as Innis Arden. Today the 147-acre (0.59 km2) estate is a public park in Greenwich, known as Greenwich Point. Several original buildings on the estate remain, including the Old Barn (circa 1887), which is the oldest extant building at Greenwich Point and is slated for restoration by the Greenwich Point Conservancy, and the Innis Arden Cottage, which was designed by an associate of Potter, Katherine C. Budd, an early and prominent woman architect. The 1903 Innis Arden Cottage is undergoing complete restoration under the leadership of the Greenwich Point Conservancy, and will open to the public in Spring 2011. Berkshire Athenaeum, Pittsfield, Massachusetts (1874–76). Witherspoon Hall, Princeton University (1875–77). Charles H. Baldwin House, Newport, Rhode Island (1877–78), Potter & Robertson. Church of the Presidents, Elberon, New Jersey (1879), Potter & Robertson. Alexander Hall, auditorium, Princeton University (1891–94). East Pyne Building, Princeton University (1896–97). Church of the Divine Paternity (Fourth Universalist Society), New York, New York (1898). ^ "SAH ARCHIPEDIA". sah-archipedia.org. Retrieved 2015-08-03. This page was last edited on 4 January 2019, at 19:26 (UTC).